I do not understand why anyone would want to be a football manager. 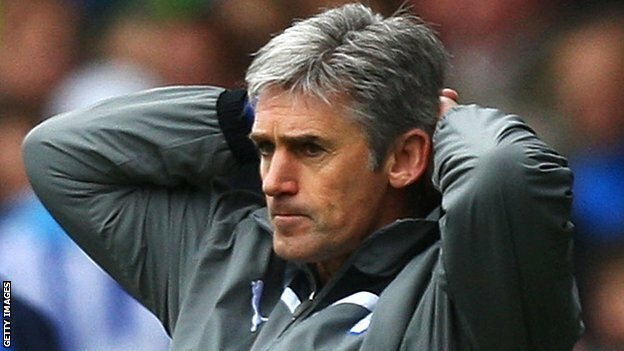 This morning I woke up to the news that yet another premiership manager had been sacked- Alan Irvine of West Brom has been let go after 7 months in the job. This season alone the football league has seen 31 managers let go, including Neil Warnock of Crystal palace after 4 months and even Paul Murray of Hartlepool after 6 games!! Imagine if this was the “real world” and 43% of managers would be sacked on an annual basis? How would companies ever move forward? And thats not even taking in to account the cost of such poor recruitment practices. Apparently, Managers who leave a club before the expiration of their contract typically receive substantial compensation in line with their remuneration package. It has been reported that André Villas-Boas received an £11m severance payment from Chelsea on leaving the club. Combine this with the £13.3m the club paid FC Porto in compensation for his services. Now add pay-off costs for his backroom staff, and compensation for Chelsea’s previous manager Carlo Ancelotti. What have Chelsea got? A bill in excess of £40m – close to the entire turnover of some smaller Premier League clubs – and the club is still without a permanent manager. This is the most extreme example of why firing and hiring with little apparent discernment is costly but does illustrate my point. The “real world” does often make the same mistakes as football clubs, but they are just not as cut-throat in getting rid of people but this can be just as costly. Too little consideration and value is invested at the front end of the recruitment process, and then companies are left with a poorly matched employee who they can’t then move on from the business quickly enough due to necessary HR guidlines. The time (and money) then spent either micro-managing that person to try and make them work, or through performance managing them out of the business is often not then factored in to the recruitment process. And the damage is done and will take more time to undo, often putting you in a worse position than when you started. Recruitment is often regarded as a 3 month process and costs are attributed to solely that function, but how much is a wrong recruit really costing you? Getting it wrong and having to move people on has an increasingly negative effect as people start to worry about their own positions. Am I safe? Should I jump before I’m pushed? It nurtures an underlying feeling of panic within an organisation, which is never going to support people in making the right decisions. Just look at the decision by Kenny Dalglish to pay £35million for Andy Carroll when he was under pressure. Was that a sound decision that he would have made under “normal” circumstances? I think not. What you need (the role specifics/outcomes/deliverables etc). Who will be the best fit (personality/background/culture fit etc). If you get your recruitment right, the rest looks after itself. Get it wrong and it gets very expensive and very messy. Just ask Steve Parish, the Crystal Palace Chairman who is looking for his 4th Manager in 18 months! Previous Previous post: I wish it could be #Housingday, everyday! Next Next post: What am I expecting to be BIG in the world of Housing recruitment in 2015?